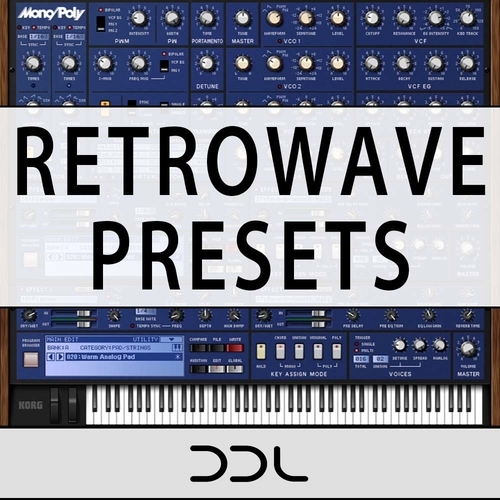 Deep Data Loops created 74 superb preset sounds for Synthwave / Synthpop productions in their new pack Retrowave Presets. Surely you want to use a vintage synth to create this specific style and KORG´s Mono/Poly (Included in their VST Legacy Collection) is one of the best. You’ll get just the right balance of bass, arp, lead, brass, pad, pluck and chord sounds to build your songs. As a bonus, all MIDI files from the demo are included. These are all in key Cm which makes it easy to find matching ones. Most of these presets can be tweaked via the modulation wheel, besides all other assignable knobs and functions of the Mono/Poly of course.